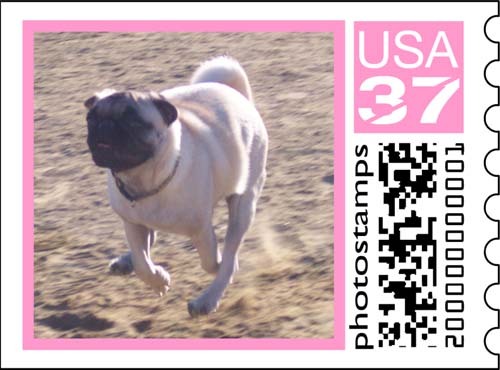 Here is my second set of US postage stamps with two of my favorite puppy photos. 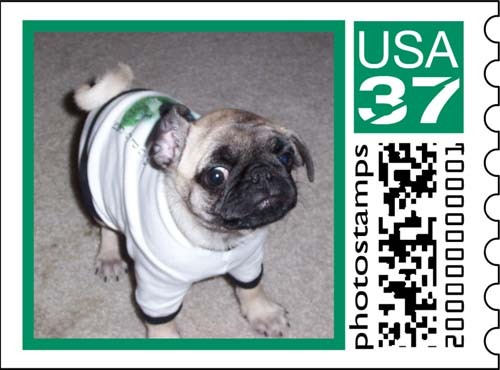 Stamps.com's photo stamp service (http://photos.stamps.com) is currently on hiatus while the Government of the United States of America studies what happens when people are given freedom of postage design :). Anyway, here are my new stamps!!! Series 2 - Number 1: This me flopping my ears while wearing my Hug Pug shirt. I love to twist and turn, which causes the flopping of my ears. what a great shot of the second one! The green stamp is sooo cute and funny. God i love this site and i love looking at your pictures, Long live Pugs!